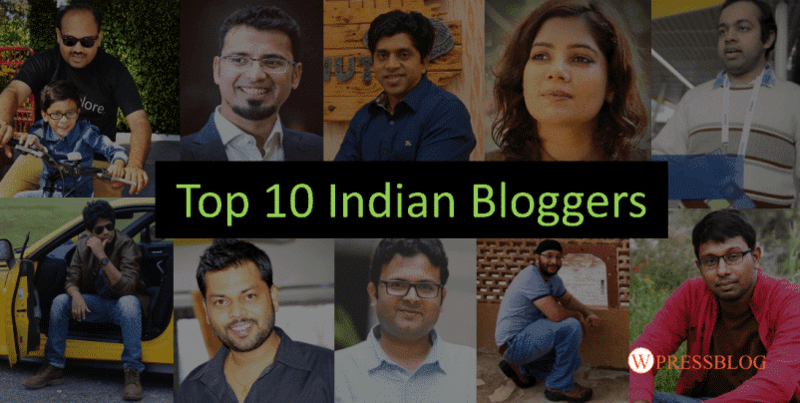 If you are running a blog and want to make more money online through your blog then here is the list of top 10 Indian bloggers of 2019. You can get inspired from them and increase your blog’s performance by reading their blogs. All are successful bloggers from India. They are blogging about different topics like WordPress, Social media, Web hosting, Mobile, Technology, Web development, How-to guides and many more. The sources of income of these bloggers are Google AdSense, Affiliate Programs, and Direct Advertisements. They are making huge income from their blog and enjoying their life more than any engineer or doctor. You can also make money from blogging like them. No big investment required for blogging. To be a successful blogger you just need to keep patience and show your talent to the world through your blog. The money will automatically flow to your bank account. Here WPressBlog has listed top bloggers from India with their income and blog details. The details about their monthly income are estimated and taken from their own blog. Amit Agrawal is the most popular and first Indian blogger. He is the man behind Labnol.org(Digital Inspiration). Amit completed graduate from IIT Roorkee in Computer Science. He quit his job and started blogging in 2004 on how-to guides on technology topics and became a first professional blogger. In 2004, blogging was extremely new. After a few months, Amit started earning huge money per month (INR 10,00,000/-). There are more than 245K Facebook followers of his blog. You can also follow him to get the latest technology news and guides regularly. Harsh Agrawal is one of the top bloggers in India. Everyone in the blogging industry will be aware of his famous blog named “ShoutMeLoud”(SML). After leaving his job from Convergys, he started blogging at SML in 2008. He writes about Blogging, WordPress, SEO, Social Media, Affiliate Marketing and How to Make Money Online. There are very helpful resources for any newbie bloggers. Harsh is a very inspirational blogger from Delhi who helped many bloggers in making money online from their blogs. Affiliate programs are the main source of his earning. ShoutMeLoud has 62K facebook followers. You can follow his blog on facebook to get the latest blogging and online money making tips. Faisal Farooqui manages MouthShut.com website. Actually, it is not a blogging site but Faisal Farooqui is a famous Indian entrepreneur. MouthShut is a consumer research and services web portal. He is graduated from New York Binghamton University. He earns a million dollars per year through his web portal. Shradha is the first female Indian blogger who founded a famous media website named “YourStory”. She started her website in the year 2008 and became very popular in a very short time. There are more than 15K stories published on her website. You can follow her Facebook page which has 1.6M followers to get information about the latest success stories, startups, business leaders and entrepreneurs. Varun manages very popular mobile blog named “Fone Arena”. He started his blog in 2005. He writes about mobile phone reviews, latest updates, latest release and many more related to mobile phones. Srinivas is the Rajnikanth of the blogging industry. He lives in Chennai and blogging about programming and web development tips. If you like programming then you can follow him and get the latest web development knowledge from his blog. Arun Prabhudesai is the man behind “Trak.in”. It is a business blog started in 2007. He publishes the latest news about business, internet, mobile, startups, etc. He also likes photography. You can follow his facebook page to get latest updates of his blog. Raju is an engineering graduate from Bangalore. He is the owner of techpp.com blog started in 2008. He publishes articles about iPhone, Android, reviews, tutorials and many technology related topics on his blog. Jaspal Singh is the man behind SaveDelete.com blog. He publishes all type of articles like technology, fashion, health, travel and many more. Apart from blogging, he loves the gym. Hell Bound Bloggers is also one of the most popular blogs if India. It is run by Pradeep Kumar who is Chennai based blogger. He is blogging about Social Media, WordPress, SEO, Make Money, Business, and Web hosting topics. He is also one inspirational blogger from India. I am confident that you liked these popular bloggers’ blog and earning and also want to be like them. Just follow their blogs and see the magic. If you know any popular blogger that should be listed here then feel free to let us know by commenting in the comment section. Thanks for sharing your valuable information. It is inspired to me. Thanks for sharing your valuable information here. It is really inspired to me. Hi, I want to inform you that you missed one more great Linux blogger Ravi Saive who runs two big blogs tecmint.com and fossmint.com. Thanks for sharing the most motivational story of top bloggers. I hope in the future I will be there. I am starting my blog with Google’s blogger blog. Is it good for beginners or should I move to self-hosted WordPress blog? If you want to make money from your blog then I recommend you to go for a self-hosted blog. You can monetize self-hosted blog easily. If you don’t have budget then you can choose Hostinger to host your website. It will cost you only $0.80/mo. I am working at “ScienceTechHub” and this is very inspiring, thanks for motivating me via this blog.